Die Cast Metal traditional outdoor lantern in Aged Bronze finished. ALL OUTDOOR POST LANTERN DOES NOT INCLUDE BULB AND POST. 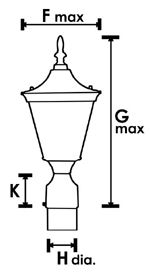 F=7.75 ", G=19 5/8 ", H=3", K=3.5"